Why take on mastery-based learning? Success in college and beyond depends not only on a student’s skills and content knowledge, but also in her ability to independently take ownership over her learning. However, even for the most vigilant student or teacher, it can be challenging to navigate the fast pace of planning, instruction, and assessment in schools to keep track of the individual steps that are crucial for learning. Mastery-based learning systems offer an approach to do just that—they help teachers and students effectively monitor learning and support independence through focused curricular planning. In our monograph entitled Building Towards Mastery, which is part of a series capturing practices and tools that support deeper learning for overage and under-credited adolescents at transfer schools across New York City, we share how Bronx Arena High School developed a mastery-based curriculum that empowered students to take ownership over their own learning, overcome their challenges, and achieve success in college and careers. 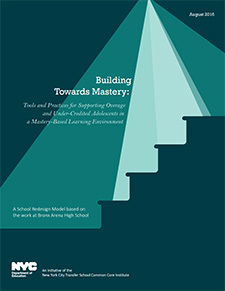 This report details how Bronx Arena designed the building blocks for their mastery-based approach and the classroom tools to support it.